A man offering refuge for homeless people ahead of the Duke and Duchess of Sussex's wedding has been cleared of wearing a mask of the Queen while driving a double-decker bus. Michael Longsmith had been accused of wearing the cardboard mask as he drove in Datchet Road, Windsor, on 17 May. But magistrates found him not guilty as the prosecution had "not proved its case beyond reasonable doubt". Longsmith, 42, was convicted of other vehicle offences. He was acquitted of driving without the correct licence, but convicted of using a vehicle without a valid test certificate and in a condition "likely to cause danger of injury". Before the trial, Longsmith admitted three charges relating to the bus tyres. 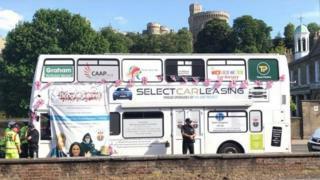 He said he drove The Ark Project's charity bus through Windsor following reports in the media about "homeless people being kicked off the streets", ahead of the royal wedding. The charity's founder, of Compton, Newbury, said he wanted to offer rough sleepers a bed on the converted bus, which had UPVC patio doors fitted instead of passenger doors. "I was there to help homeless people. To cheer the royal family on," he said. Police said Longsmith was seen wearing the mask - which would have impeded his vision - but Longsmith denied wearing a mask when he was driving and said he wore it before taking the wheel. The court heard police believed the bus had more than eight seats, which would have affected how its licence was categorised and whether Longsmith was legally able to drive it. Longsmith said the bus had been converted into a "mobile project vehicle" with 15 beds for homeless people to use. He said high-ranking police officers and MPs had been on the bus during its rounds as a soup kitchen. Lead magistrate Anne-Marie Adams said the charge could not be proved and therefore his driver's licence "was adequate". He was fined a total of £245 and given three penalty points.